Welcome to Embrace Healthcare, experts in fluid protection. We manufacture and distribute some of the finest facial fluid protection products in the industry. Our UltraClear™ Technology helps keep our splash masks, eye shields and glasses fog free on both sides, static free and optically clear. You can rely on Embrace to be your trusted healthcare partner. If you are interested in a product not shown here, please contact us. In addition to our flexible manufacturing capabilities, we also can source products through our global procurement network. You can rely on Embrace to be your trusted healthcare partner. New! This product offers exceptional function and value! A unique combination of convenience, comfort, style and value are now available in this new disposable eye shield. The shield can be replaced in a matter of seconds providing extremely economical eye fluid protection. 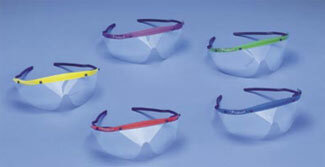 Additionally, by replacing the eye shield and reusing the frame, the cost per use is significantly reduced. Another innovative product from Embrace! Our Splash Mask Face Shield utilizes UltraCleartm technology. Solid or vented foam for better breathability and comfort. Soft elastic or adjustable Velcro straps. All straps are secured to shield with an eyelet (not a staple) for safety. A comfortable, convenient, cost-effective way to comply with O.S.H.A fluid protection recommended standards. Velcro™ is a registered trademark of Velcro Corp. According to O.S.H.A. regulations1, "If glasses are the chosen method of eye protection (from splashes, spray, splatter or droplets of blood and other potentially infectious materials), they are to be equipped with solid side shields". 1 Federal Reg. / Vol. 56 No. 235, Dec. 6, 1991, Rules and Reg. Sturdy, comfortable and snug-fitting for excellent fluid protection. Clear, lightweight plastic glasses provide wrap-around fluid protection and an extremely comfortabel fit. Pleated, comfortable and fluid resistant protective face mask that breathes extremely well. Fiberglass and latex free. 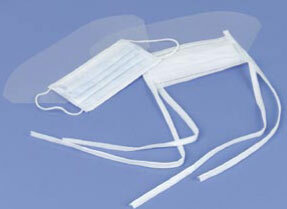 Pleated, comfortable and fluid resistant face masks with integrated UltraClear™ wrap-around face shield. This product is anti-fog on both sides, anti-stat and optically clear. Single use, comfortable, stable and secure head immobilizer that is impervious to fluids. New! 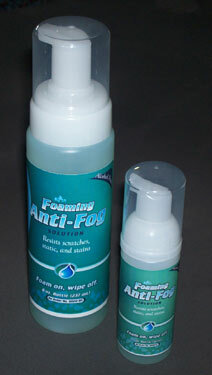 The Embrace Foaming Anti-Fog solution stays where you put it - No dripping or running - Just foam on and wipe off. This product cleans and resists scratches. The unique foaming dispenser yields approximately 5 times the applications of traditional spray and squeeze bottles making it more cost effective to use.